Shopify scripts are one of the lesser-known features of the Shopify Plus platform. However, they are probably the most powerful. They allow merchants to create Ruby scripts that can automatically discount items, offer free shipping and modify payment gateways based on who the customer is and/or what they have in their cart. First thing first, you will need to install the free Shopify Script Editor app via the app store. Keep in mind that this app is only available for Shopify Plus merchants. Line item scripts. They affect line items in the cart and can change prices and grant discounts to your customers. Shipping scripts. They interact with the Shipping API and change shipping methods and grant discounts on shipping rates. Payments scripts. They interact with the Payment API and can rename, hide and reorder payment gateway. Output: for verifying the results of the code and the input. Ready to dive in? You’ll find below 3 curated lists to get you started with Shopify scripts. Keep in mind that you must be a Shopify Plus merchant with the Shopify Script Editor app installed. Oh, and here’s the official documentation. It might come handy. 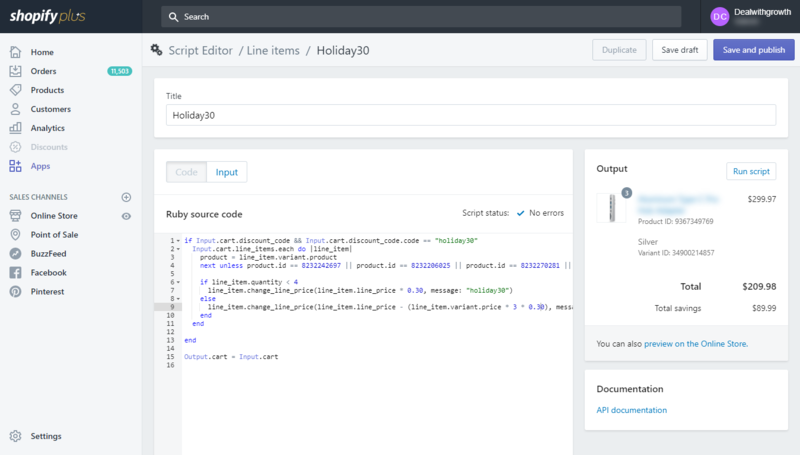 Shopify has recently released a web app to quickly create scripts without Ruby knowledge. It’s still in beta but you can give it a try here.